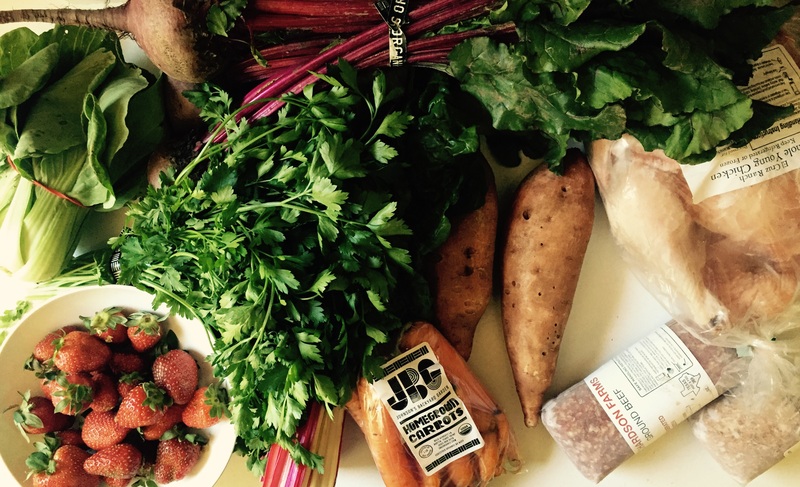 The bok choy and a lone beet are languishing in the fridge, the sweet potatoes in the pantry. Other than that, here’s what we ate this week. Plus gobs of Easter candy, of course. 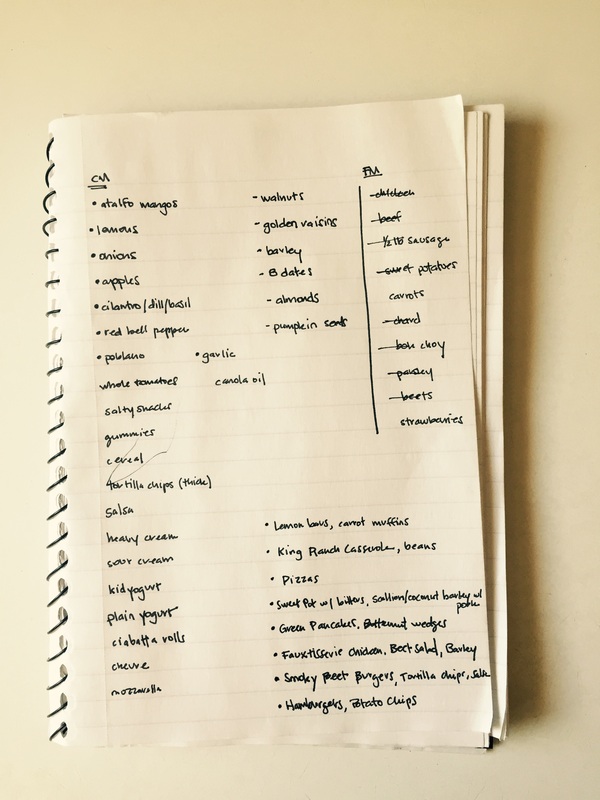 I started with a list of the stuff I bought at the farmers’ market, and then wrote down a menu plan and added the grocery store items I’d need to make it happen. I didn’t make the beet burgers or the sweet potatoes with bitters , so those are up for early next week, to use said sad beets, bok choy, and sweet potatoes. 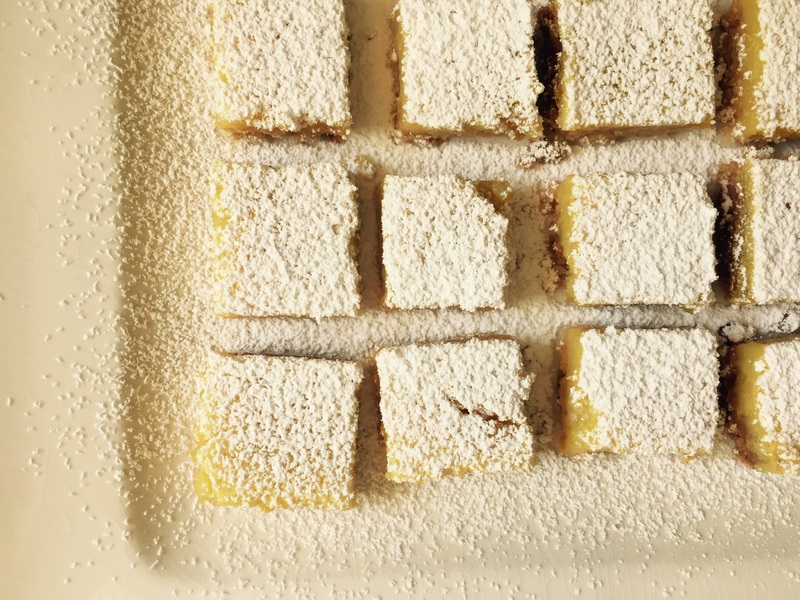 Gluten Free Lemon Bars. So good, and damn easy. Press-in shortbread crust (no rolling!) and you just mix the lemon goo in a bowl and pour it on the cooked crust and bake a little more. Is that how you make all lemon bars? It’s been a while since I have and I was expecting to have to use a double boiler and make some silly lemon custard thing. Dangerously easy. Made gluten free by subbing Cup 4 Cup for all purpose flour, but I had to use more than a cup to get the right dough consistency. 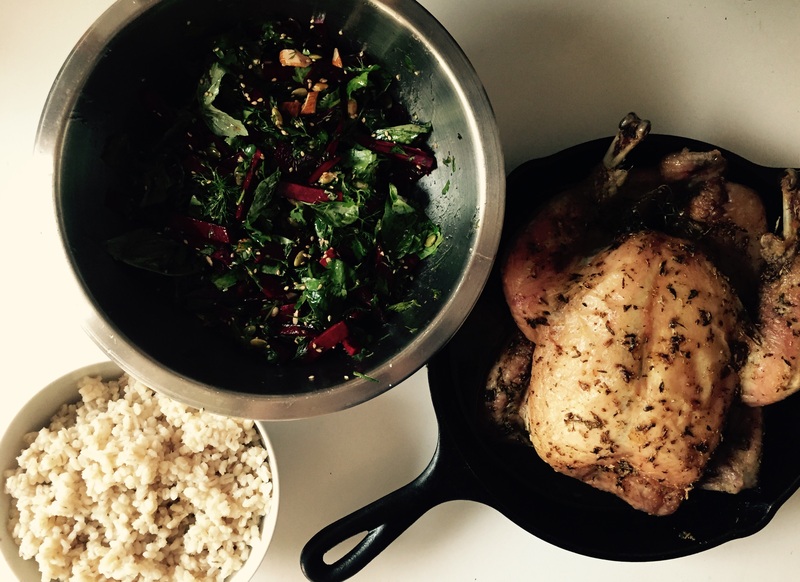 Faux-tisserie Chicken, Raw Beet and Herb Salad, Barley. Probably my favorite meal this week. The chicken is slow roasted at 300 degrees for 3 hours, after being rubbed with a gorgeous herb paste loaded with crushed fennel seeds and marjoram. The result is totally tender and easy-to-shred meat with thin and fragrant skin. I still love Thomas Keller’s easy roasting method (3.5 lb bird + salt and pepper for one hour at 450) and I think the skin is crisper and meat juicier with that method. But this slow-roasting is a nice change of pace and made shredding the remaining meat for another dinner super simple. The raw beet salad, y’all! Have you had raw beets? Why doesn’t everyone eat them? It was my first time, and I prefer it about a trillion times to the roasted variety. The texture is great- like a more toothsome carrot? And the flavor is more subtle, less sweet, mildly earthy, which I really really liked. This salad is brilliant. You quickly toast almonds and pumpkin seeds and sesame seeds, toss it with thin beet slices, loads of herbs, and a simple lemony vinaigrette. Perfect. The barley is there because Henry needs-must have some kind of simple starch with his meals. Pasta with Parmesan and Pepper. Speaking of simple starches, this is a favorite lunch of my kids. 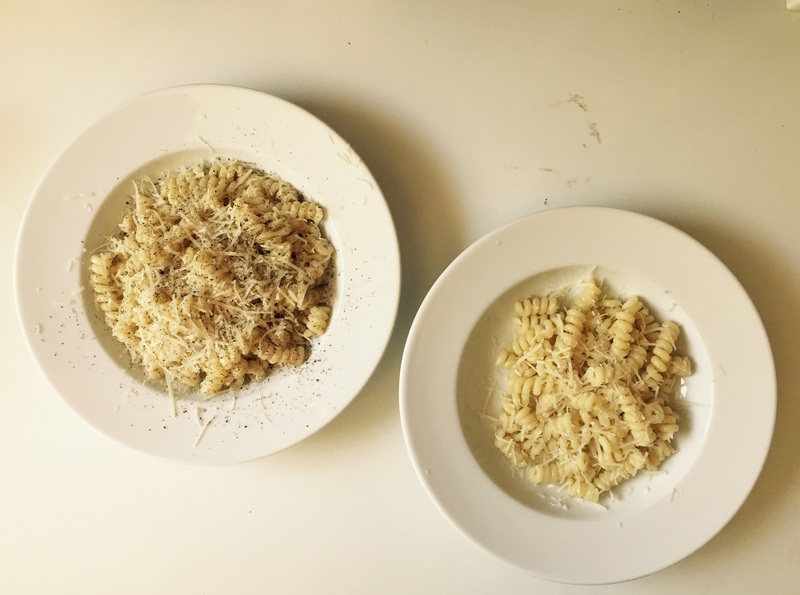 Just buttered noodles with parmesan. Which truth be told I love too, but I’ve taken to adding an over-the-top amount of cracked pepper in order to bump up the flavor. It’s like a very lame cacio e pepe. King Ranch Casserole. A fantastic way to use the rest of the chicken I shredded off the roasted bird. 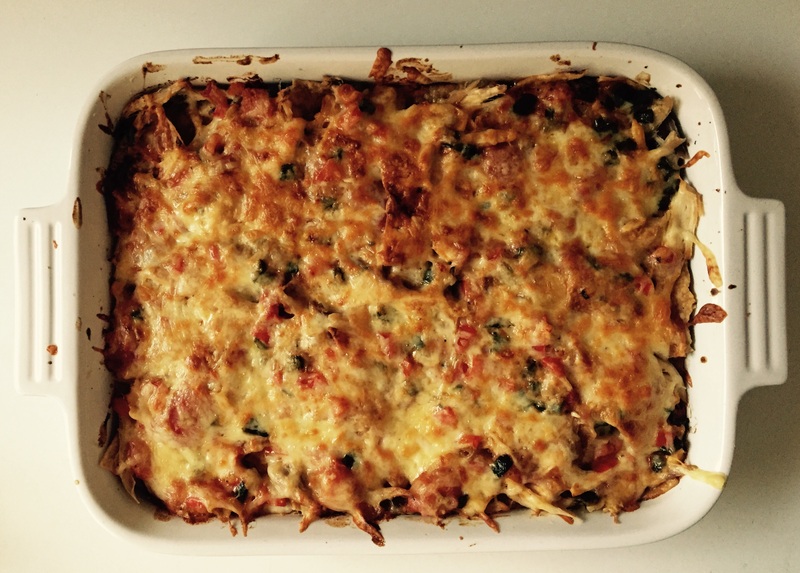 There was a time when I was too much of a food snob to make king ranch casserole. Maybe because it’s loaded with cheese? I’m still a horrible food snob, but I’ve made room in my heart for this dish because it is damn delicious. And really good and wholesome and not worthy of my misplaced scorn. If you’ve never had it, it’s sort of like a tex-mex chicken tikka masala meets chilaquiles. Which sounds bizarre but is amazing. Do yourself a favor and skip the tortilla-frying step and just use tortilla chips instead. Crush ’em a bit if you need them to lay flat. I like El Milagro’s thick chips, if you’ve got those in your grocery store. 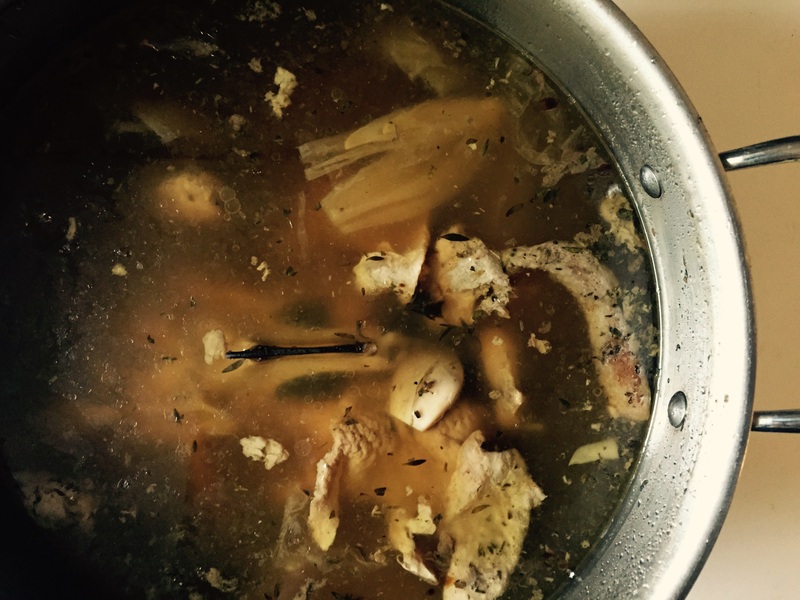 Chicken Stock. I like to make stock the same night I roast a chicken. After pulling the rest of the meat off the bones, I put the carcass, all the pan drippings (considerable after a three hour slow roast!) and skin and fat into a big pot. I fill it up about an inch below the rim with water, and toss in an onion, three garlic cloves, a carrot, and some salt. Bring this to a boil, and then cover and put in a 300 degree oven overnight (8-12 hours). Your house will smell amazing when you wake up, and you’ll have gotten every ounce of flavor from your bones. This stock was used for matzo ball soup at our Passover Seder this weekend, and the fennel seed gave it a lovely nuanced flavor. 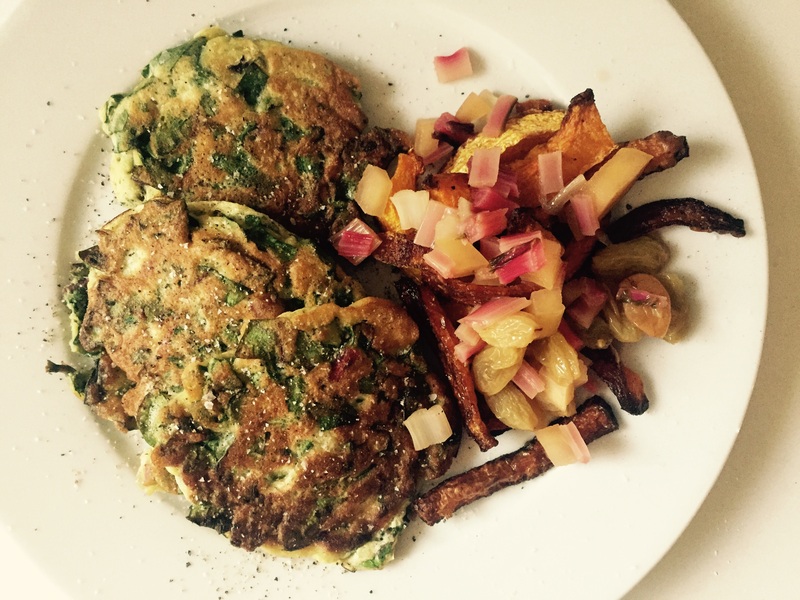 Chard Pancakes, Roasted Butternut and Carrot Wedges with Chard Stem and Apple Relish. I love these little green pancakes, which are fluffy and light with whipped egg whites. And they remain one of the very few ways to get my kids to eat chard (presuming that I’ve got tons of sour cream for them to dip the pancakes into). Andy says it’s an acceptable way of eating chard, but he’d rather not have to eat the stuff at all. The butternut and carrots were leftovers from the week before, so I roasted them at 400 for about 45 minutes with salt and pepper. I used the chard stems in place of the fennel in the relish recipe I linked to above, and I thought it was a fine substitution, and it felt nice not to toss the pretty stems. That relish is too sweet though. Next time I’ll add some vinegar for an agrodolce (sweet and sour) attempt. Burgers. A peace offering after making my family eat chard and squash for dinner. 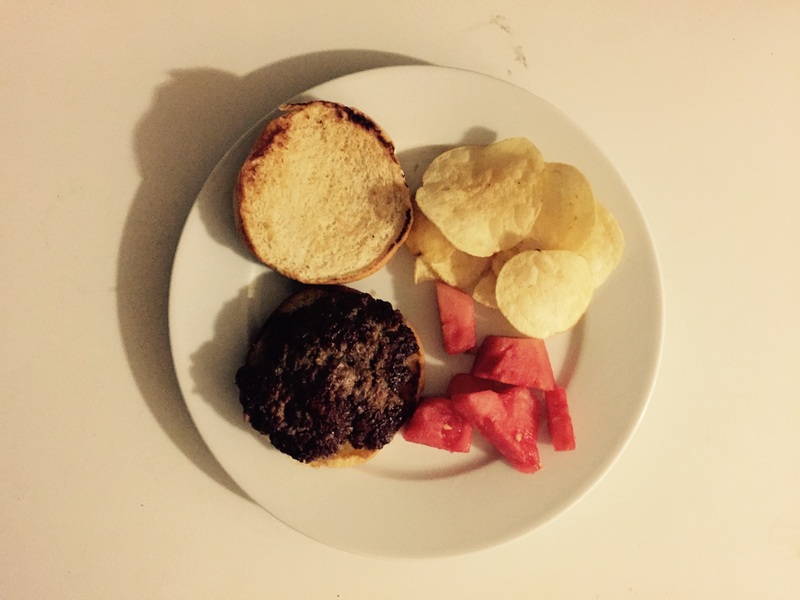 I very very rarely make burgers, but they are everyone else in the family’s favorite thing. I love the smash burger technique, which you can read about here. Basically, the old adage that you shouldn’t press down on a cooking burger is true EXCEPT if you do it in the first 30 seconds. If you mash it down hard into a hot cast iron skillet as soon as you drop the patty into the pan, you’ll get almost total contact between the meat and the pan, which means the best crust you’ve ever had on a homemade burger. Crust/beef fat equals beefy flavor, so these taste amazing. After the first side is done cooking, flip and top with cheese. To really go over the top, I spoon the hot fat from the pan over the cheese to melt it. Henry hates cheese in any form except on pizza, so I used his for the picture so you can see the crust on the patty. As well as the bad lighting would allow. The watermelon, desperately out of season and from Guatemala was a treat Henry pleaded for when he saw it at the grocery store. I had to give in. Strawberry Yogurt. I bought a big tub of Greek yogurt to eat with last week’s granola, and to use to top the beet burgers that I didn’t end up making this week. 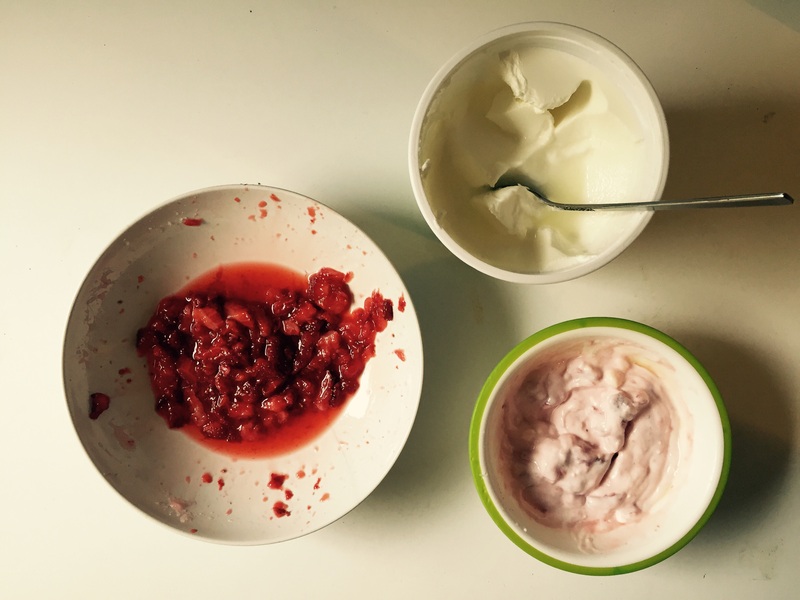 But when our strawberries started looking sad in the fridge, and Henry ran out of his beloved yogurt-in-a-tube, I made him some homemade stuff with the plain yogurt mixed with mashed strawberries and enough honey to make it appeal to a preschooler. Pizza with Homemade Dough. 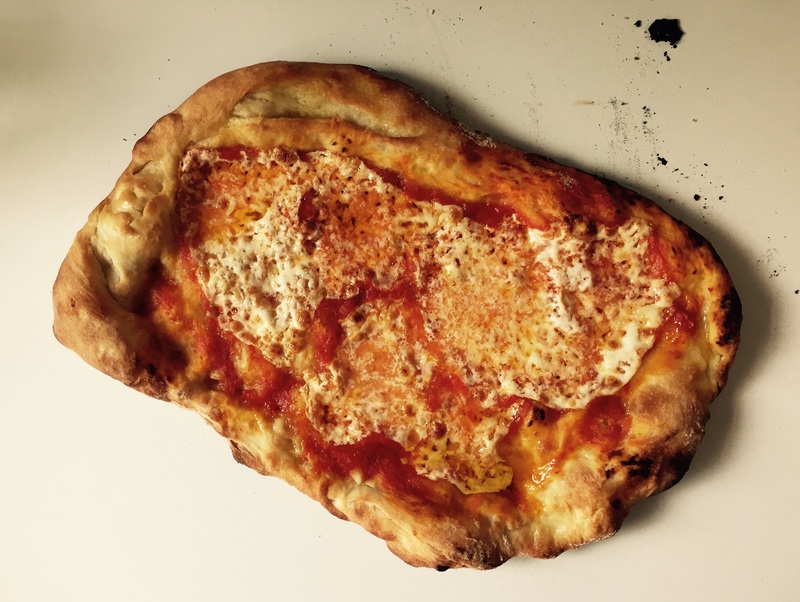 This pizza recipe is the best, hands down. But you have to crank your oven up as hot as it will get, so do it now before summer gets here. Also, the bottom of the crust ends up super floury when I make this (I use a lot so it doesn’t stick to the cutting board I’m using as a pizza peel), which I don’t love. I think folks use semolina for this, which maybe has a less objectionable flavor? I’m going to try it next time, because otherwise I think this is perfect. Matzo Brei. Ahhh I love having leftover matzo in the house! 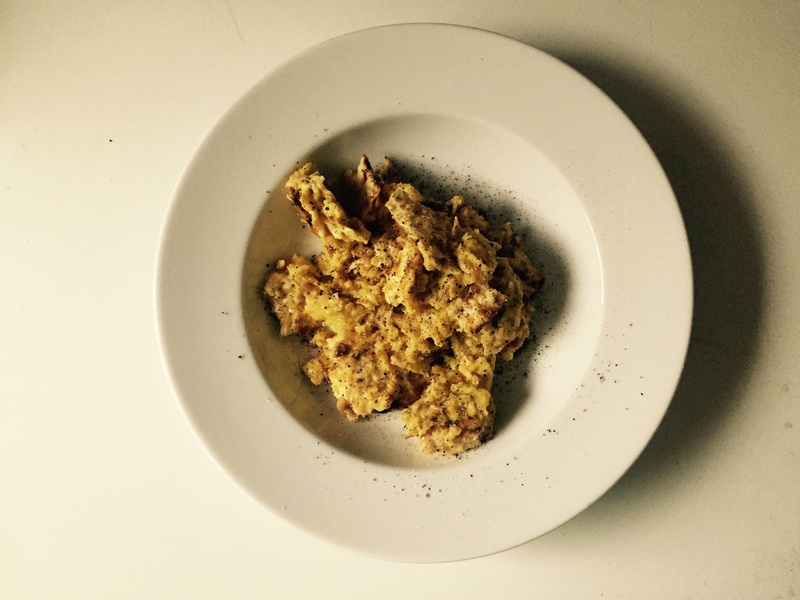 This is like Jewish migas and is one of my favorite breakfasts. 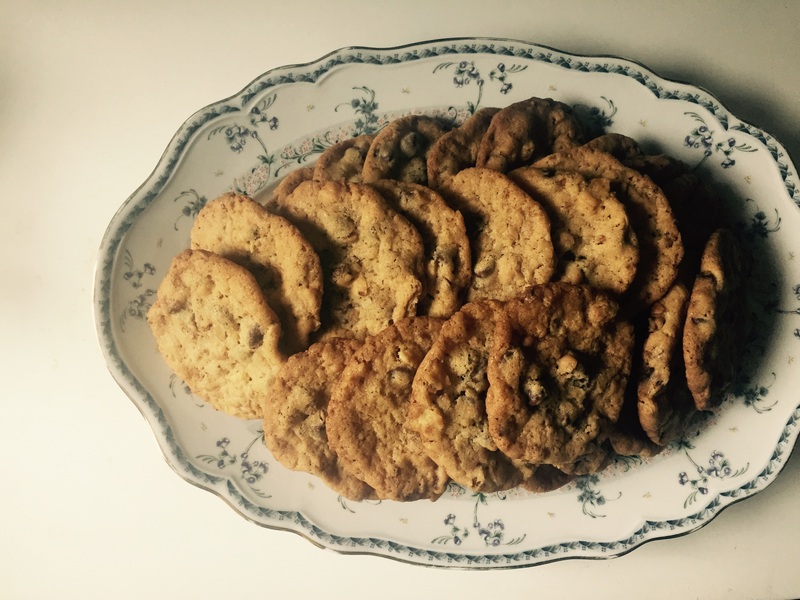 Magical, Marvelous, Memorable Cookies. Maybe my favorite cookie of all time. I have to make them when I’ve got granola in the house. You also add salty snacks (in this case crushed potato chips and pretzels) and chocolate chips. These delightful add-ins are surrounded by the most buttery, toffee-y cookie that is melt-in-your-mouth crunchy on the outside and tender in the middle. I brought them to an Easter potluck with Andy’s family, and his Grandpa, Ito, ate one and then went back for 4 more and wrapped them in a napkin and tucked them in his bag to take home. It was my favorite. So next week: beet burgers, sweet potatoes cooked with bitters, and other stuff I haven’t planned yet. Hope to see you then! I really love this new blog format! And I love that you forced them to eat the chard then they got to have burgers. Hey I have chard coming out my ears in the garden, would you like to test your families’ patience with MORE? Hah! Yes please, Abbie! It will be an all-chard diet with your assistance! We do a roasted chicken a week and then stock… I am going to try the 3 hour roast next time he second meal is chicken soup for the shredded chicken aspect. Also beet salad is all the rage is Santa barabara, every place in town has to have one. Beets, goat cheese, arugula, some type of nuts and dressing… So yummy!! I love the new blog format!